My sisters and I were planning an outing to get together with our friends and beaus. The original plans as to go to Snakes and Lattes, but a Friday night and they do not take reservations… we decided to meet at a bar instead. Brent suggested we all meet at Gaslight, best new bar of 2014. No arguments here, that is until I saw on a map how far it was. It was out at Dundas and Bloor, a good hour and a half walk from our place. Brent sweetened the deal: on the way there we would stop for best sandwich, and on the way home from Gaslight we would stop in at Comedy Bar, best comedy club in the city, for a show. We had been waiting for years, keeping an eye on the shows. Nothing ever caught our eye, until now. It would have been nice when we lived one block over. Ah well. The whole walk all I could think about was the smoked ham sandwich I was going to order from Brock Sandwich, in the city of course. The anticipation made the walk fly by and it did not seem far at all. Turns out I had been right for picking the smoked ham sandwich, it was on their specialty board… and it was sold out. I chose the prosciutto sandwich, because in my moment of panic it seemed the closest thing to smoked ham. 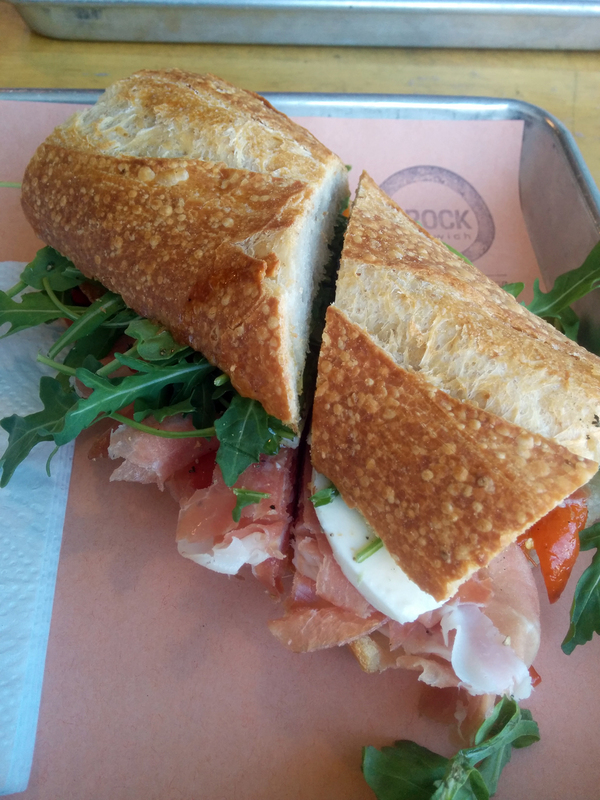 The sandwich was served on what I think was ciabatta bread, with arugula and fresh mozzarella. It was a very refreshing and delicious sandwich. It was also the polar opposite of Brent’s crispy chicken sandwich, whihc was equally delicious. It just went to show how amazing Brock Sandwiches is. Two completely different sandwiches and yet both so tasty. It was well worth the walk and I wish they were closer. 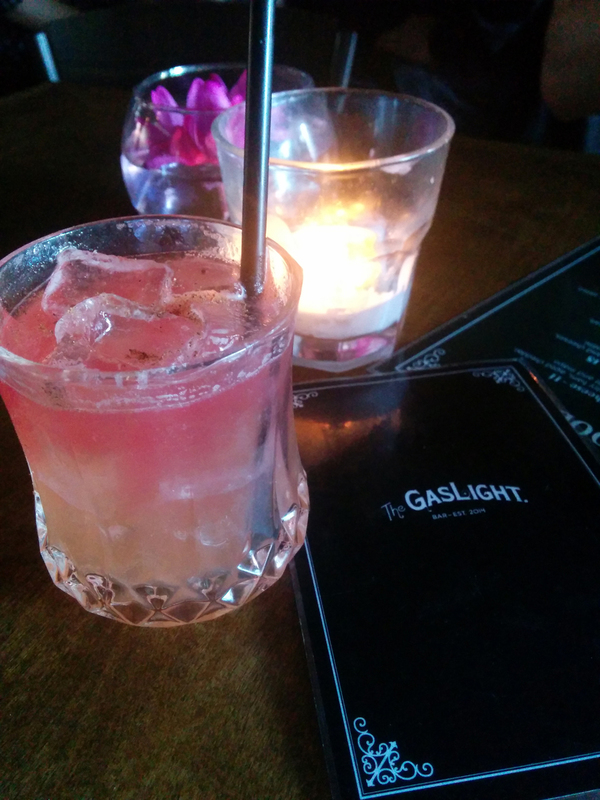 We got to Gaslight 40 minutes early, it was an awkward situation as the bar is small, it was just the two of us, but we were expecting about 8 more people. Thankfully the bar never got so full that we had to relinquish our table for a smaller one. Instead of going the usual route and ordering wine, I instead opted for trying all three drinks on their fancy cocktail menu. To start I had the rum punch, it seemed like a fun kick-off. Soon though my cravings got the best of me, and I caved to my temptations and ordered a slice of raspberry-strawberry pie. 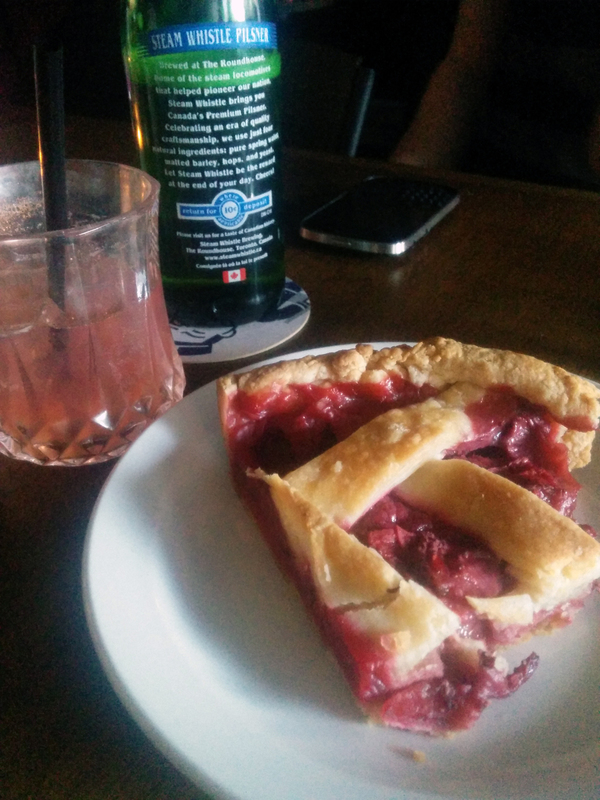 We were in a bar, I did not have high expectations, I do not even like pie that much. But oh my, this pie was amazing. They served it warmed up. 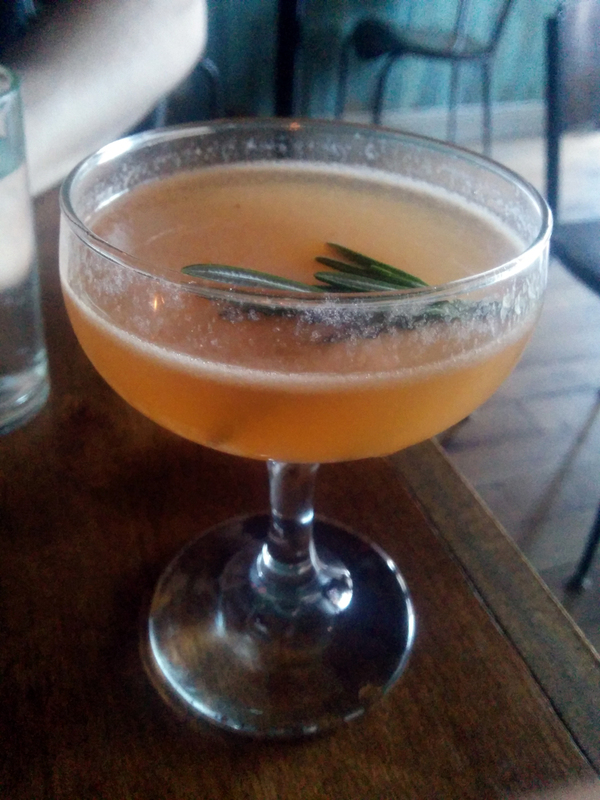 The second cocktail was the clear winner, it had ginger beer in it and was garnished with rosemary and it had a spicy kick to it. It was odd but it worked. The third drink was much stronger. I did not have high hopes for the Comedy Bar. From the outside it looks sketchy. Once inside it was a mass of people crowding a bar, there was no clear indication of where the comedy itself would take place. Only after we wandered through some back hallways did someone tell us we had to exchange our printed-at-home tickets for actual tickets and that we would be called in once it was time for the show. I’m not really sure why it was voted best comedy club in the city, maybe the relaxed atmosphere, maybe the bar part? It was still good. It was a beautiful Saturday and we had an amazing plan. Cut through Kensington Market, stop for churros and cheesecake, see if the Colombian bakery is still open, all on our way to Rock Lobster. We got to Wanda’s Pie in the Sky and they were sold out of cheesecake. Part one of our plan, to eat the best cheesecake in the city fell through. Which was not too, too bad given the place was packed (as you would expect on a gorgeous Saturday afternoon, even the patio was full) and we still had a lot of eating ahead of us. Plus I had not planned ahead, I needed to come back to get some wood-fired bagels from Nu Bagel (I plan on making jam soon, and homemade jam on wood-fired bagels is my idea of heaven). The Colombian bakery, voted best Latin American bakery a few years ago, was indeed closed*. We finally lucked out when Pancho’s was open. Best churros in the city, but I already knew that. Pancho’s Bakery has been my go-to for a couple of years now. They even inject the churros with your choice of sauce. You can’t go wrong with dulce de leche. Brent had the chocolate and it was a messy disaster. It was dripping everywhere, down his sleeves, on his pant leg and I think a drop even got his shoe. In this mess I saw an opportunity, an excuse really. It just so happened that on the way to Rock Lobster we were passing a Tim Horton’s, and we still had plenty of time before Rock Lobster even opened. Why not drop in for an iced capp? Brent needed to wash the chocolate sauce off anyways. Excuses, excuses. Even still with the pit stop we got to Rock Lobster too early, we wandered around fora bit and still came back right at open. We were the first people in there. Sometimes in eating your way through the best food in the city, you come across food items that are not to your liking. Brent usually takes care of it, ordering salads and giving me one teensy bite, therefore it counts. I tried it. The Caesar was our Everest, we both hate the drink, alas we had to conquer the best Caesar in town. Brent did not order it right away, he left it for last. 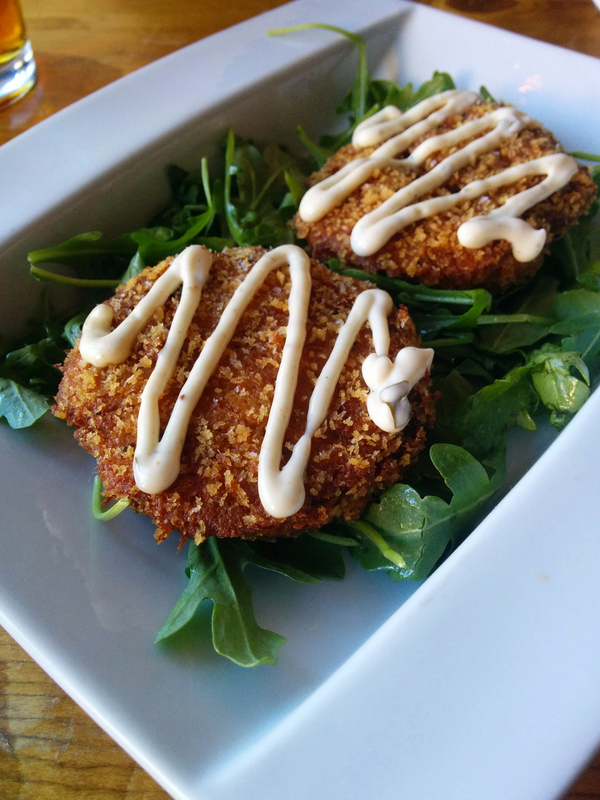 To start we split a plate of lobster cakes. 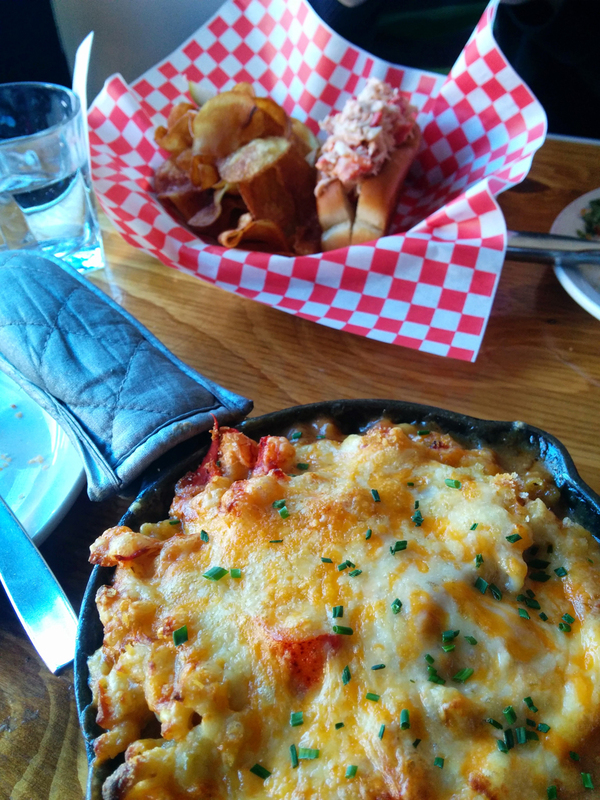 They were amazing and I really wish I had ordered them as my main, instead of the lobster mac and cheese. Yes it satiated my curiosity. Yes it was tasty. Yes it was full of lobster meat. But the portion was far too big and eventually the cheese became overwhelming (yes there is such a thing as too much cheese). I had a bite of Brent’s lobster roll and it was easily the best I have ever had. I am not usually a huge fan of them, as they are usually dripping with mayo and it gets gross. This lobster roll was perfect. Tons of lobster meat, with just the right amount of mayo. Then came time for the Caesar. I don’t know why we did not just veto it. 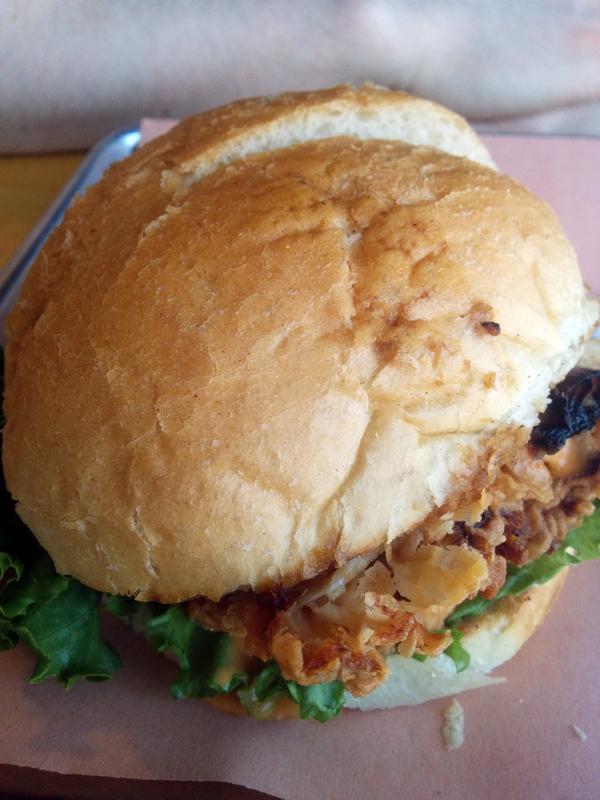 We are not covering everything on the best of the city list on BlogTO, we only focus on the food. I really do not feel like going to the best dry cleaner in the city. I had a tiny sip… and I regretted it. I hate tomatoes, I hate clam juice, oh and I hate tomatoes. Brent slowly (somehow!!!) managed to finish it. The saving grace was the giant lobster tail that garnishes it. It’s no empty garnish, there was plenty of lobster meat in that tail. 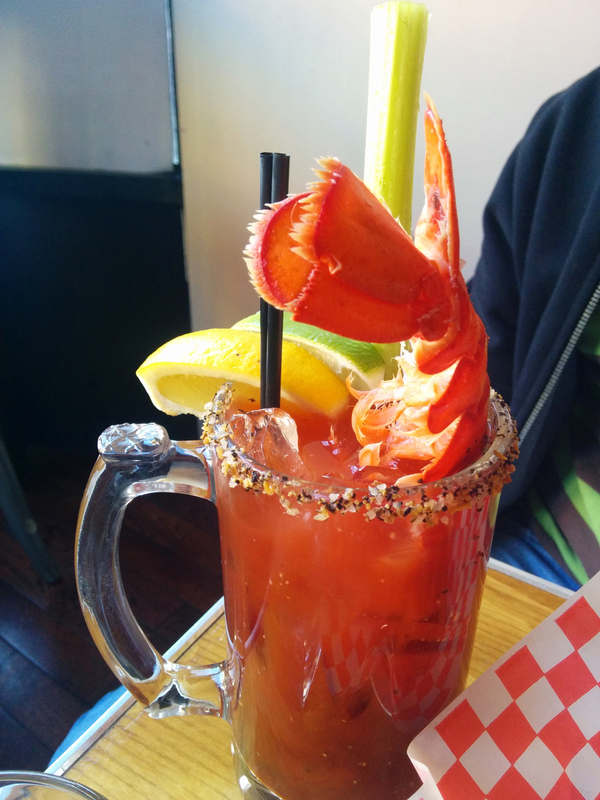 If you like Caesar’s, then yes, Rock Lobster has an amazing one. If you don’t like Caesar’s, as far as I can tell, there is nothing that will ever make you like them. Or at least for me this is true.